Golden Eagle in Tallahassee offers some of the best golf course living in North Florida and features an award winning Tom Fazio golf course. We have been providing home sales reports for Golden Eagle in Tallahassee for many years, and the changes that have occurred due to fluctuating market conditions is very evident in the real estate graphs that we provide. The reason that we provide so many home value and price reports for different neighborhoods in Tallahassee is to ensure that homeowners understand what they need to do. Nearly 60% of homeowners who listed their home for sale in the Tallahassee MLS over the past five years left the market without selling their home during that first listing period. Considering that market values dropped during that entire five year span, home sellers lost money due to incorrect pricing. For those that continued to re-list their property, we have noticed that many were not willing to face the facts soon enough. 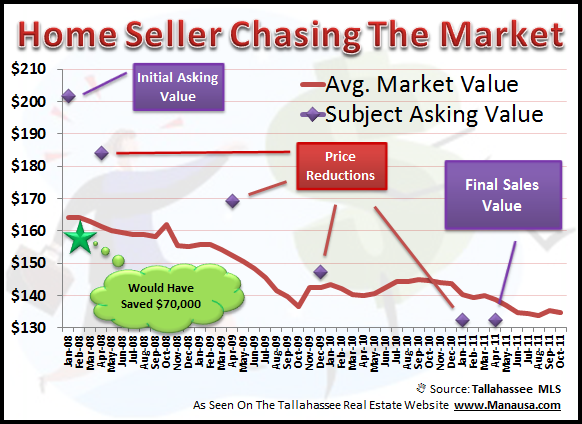 The following graph shows an example of a home seller "chasing the market" in Golden Eagle in Tallahassee. I met with this homeowner (Golden Eagle in Tallahassee) in December 2007 and advised them of the current value for their home and gave them specific pricing guidance. While they liked our aggressive internet home selling plan, they were wanting to get a lot more money for their home than I knew the market would bear. I told them I could not in good faith list their home at that price. They found a real estate agent that told them they could deliver the higher price (I guess they were hoping for un-informed buyers that would pay "above appraisal" prices). This graph shows that had they listed the home at my recommended price, they would have sold the home 3 years faster and received an extra $70,000 at closing. 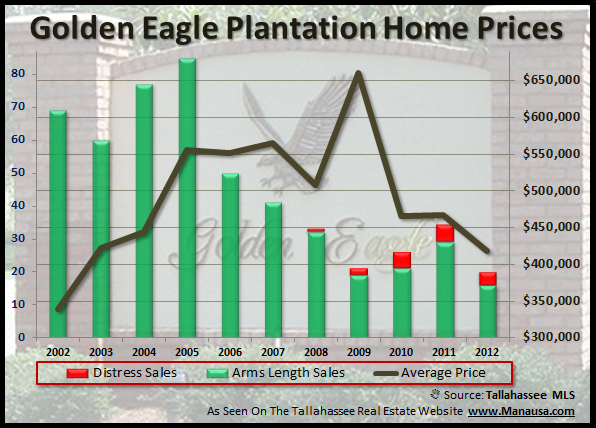 Average home prices for Golden Eagle in Tallahassee have dropped 27% since the peak of the housing market, and thus far in 2012 the average sales price is just under $413K. 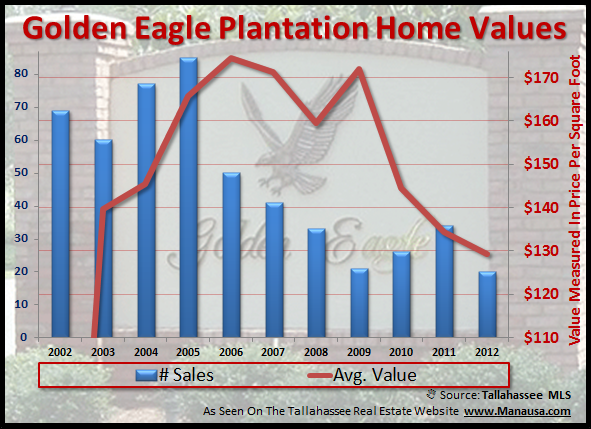 Home values for for Golden Eagle in Tallahassee are down as well. The average price per square foot of homes that sold in 2012 has been $125, down 29% from the $174 per square foot attained in 2006. The following list of home sales for Golden Eagle in Tallahassee comes from the Tallahassee Board of Realtors Multiple Listing Service. I hope you have gained some useful information from this report. Please check back again in the future for more Tallahassee neighborhood real estate reports including home sales in Golden Eagle in Tallahassee.